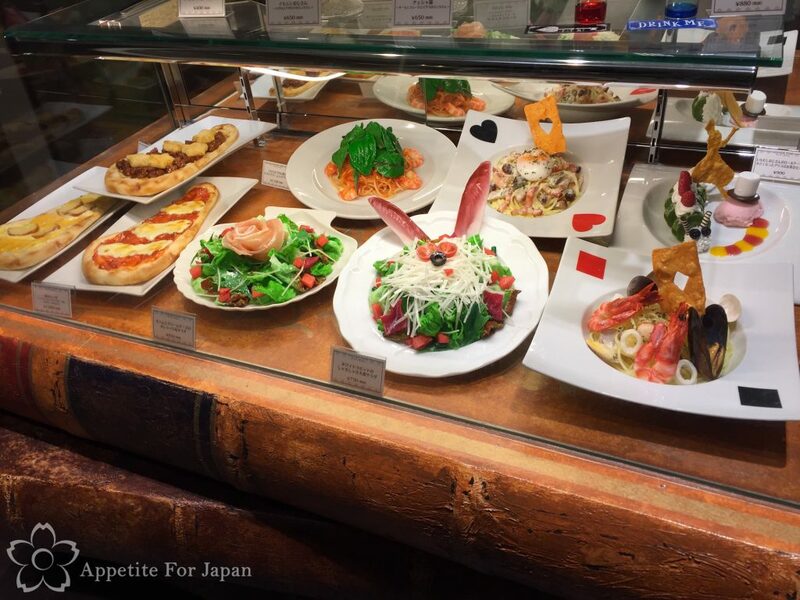 Alice in Wonderland is very popular in Japan, as are themed cafes and restaurants. 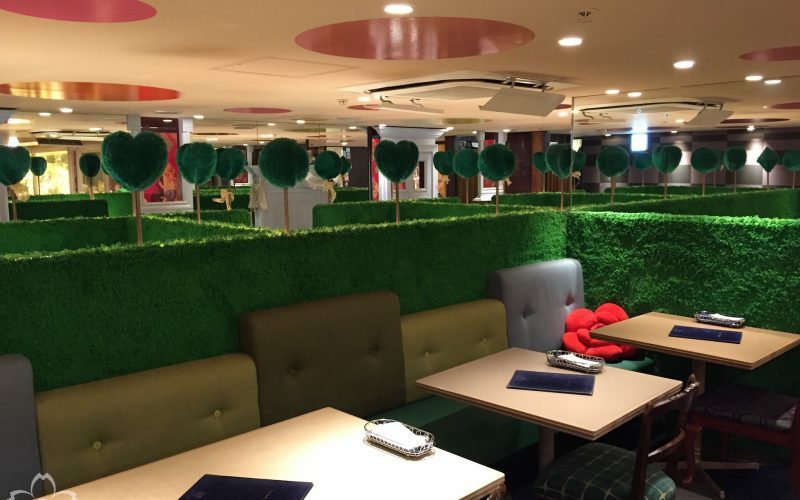 And there are, of course, several Alice in Wonderland themed restaurants in Tokyo and beyond. 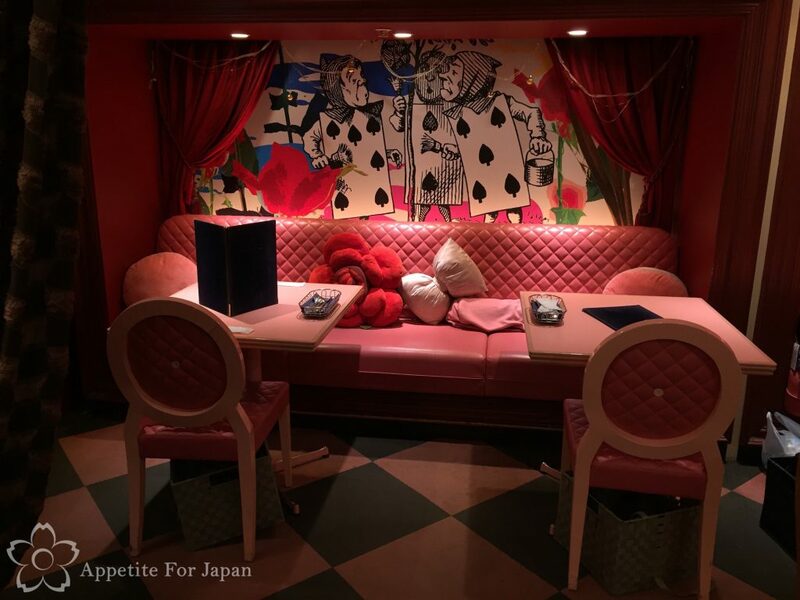 This is our second Alice in Wonderland dining experience, this time in the Tokyo suburb of Shinjuku..
Alice in Magical Land (魔法の国のアリス), also known as Alice in A Magical Land, or sometimes translated as Alice in the Magical Country, is one of two Alice in Wonderland restaurants in Tokyo’s suburb of Shinjuku (新宿区), and one of seven Alice in Wonderland restaurants run by Diamond Dining (of Vampire Cafe and Kawaii Monster Cafe fame) as part of the Alice’s Fantasy Restaurant chain around Japan. 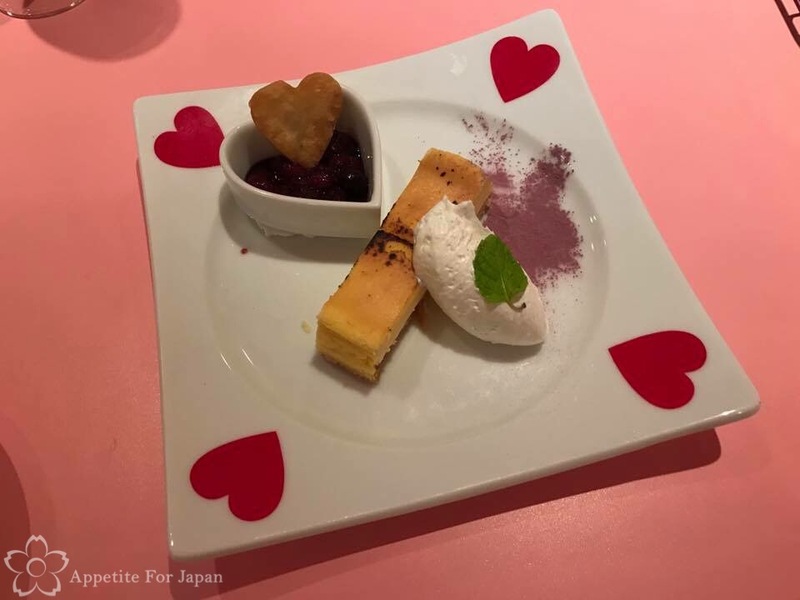 Having previously visited the Shibuya branch, Alice in a Dancing Land, we were keen to try Alice in a Magical Land as each restaurant has a slightly different take on the Alice in Wonderland theme, different food, and is run in a different way. 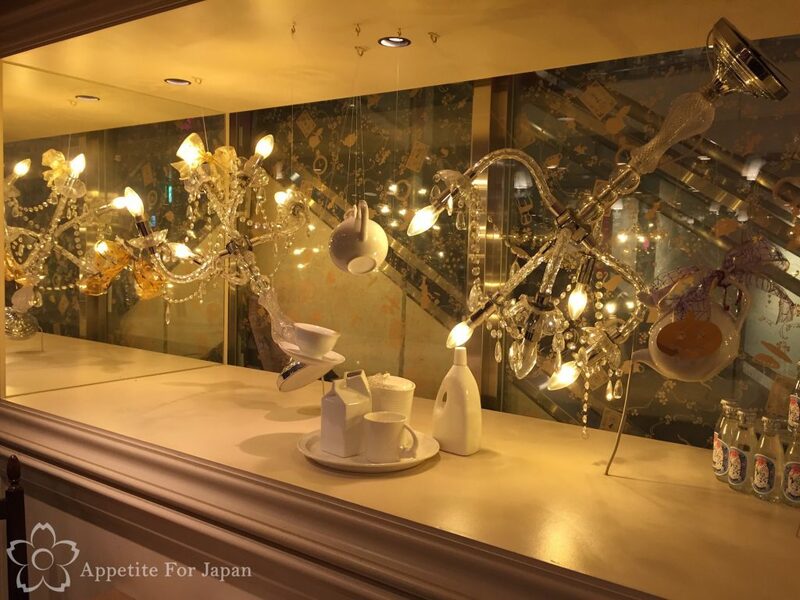 Alice in a Magical Land is located at the basement level of a shopping mall, a short walk from Shinjuku Station. The fake food out the front of the restaurant looked great. 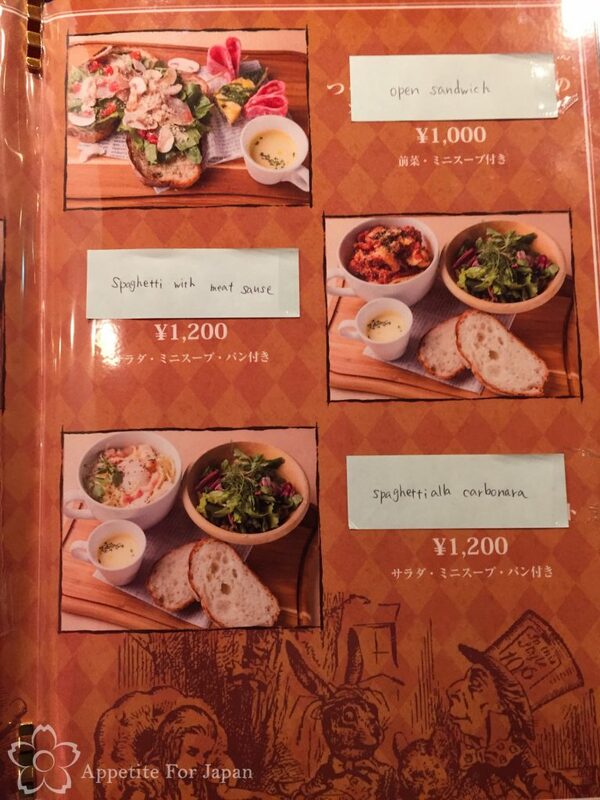 Sadly none of these meals were available to us as part of the lunch menu. These must be from the dinner menu. We were surprised to find that we were the first customers of the day. A family came in soon after, but apart from that, the restaurant was empty. 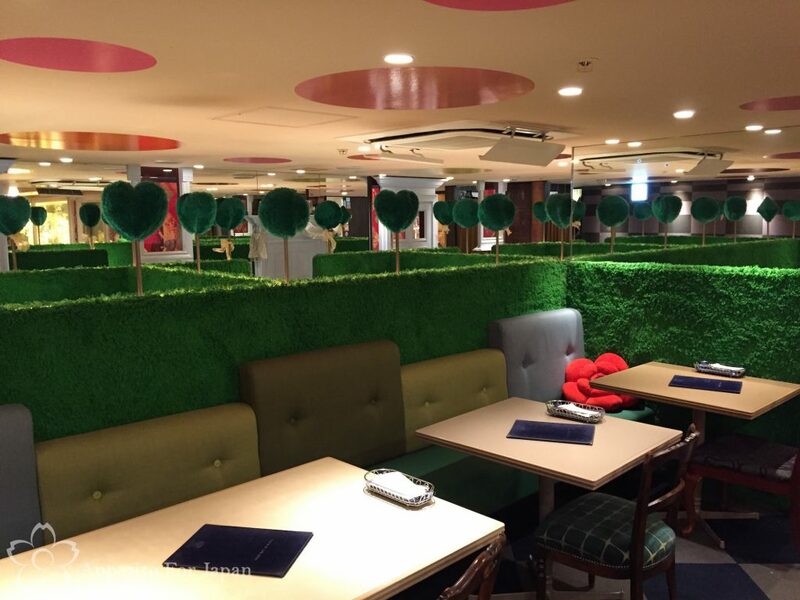 We were hoping to be seated by the cute green, furry hedges, but although the restaurant was completely empty, we didn’t get to choose our table. I have to say that this restaurant looked so much better in the photos on the official website, than in person or in any of our photos. I’m not saying that it didn’t look kind of cool, but the whole expectation versus reality thing left us feeling a little underwhelmed. I think we’ve also been spoilt by some of the other newer themed cafes that have even better decor. To their credit, the staff were happy for us to wander around and take photos. 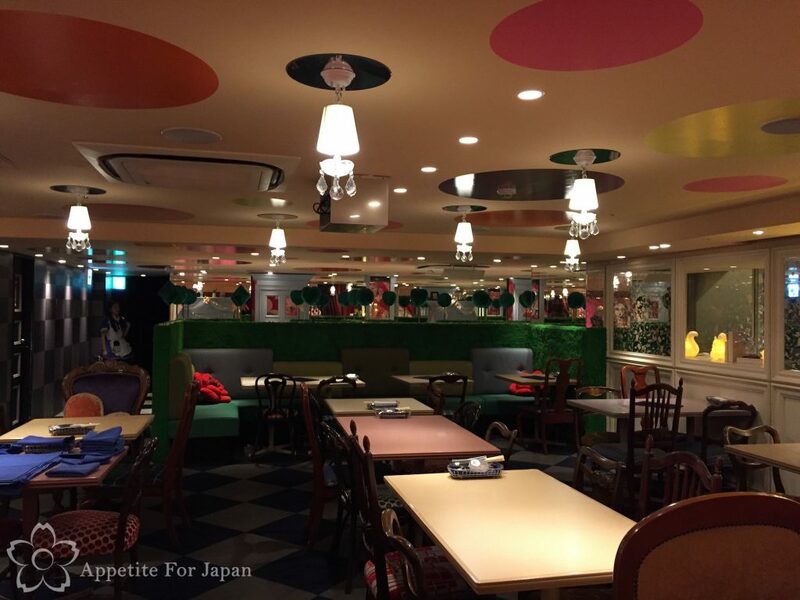 A lot of restaurants – including theme restaurants – in Japan don’t allow photos, so it’s really great when they do let you. Above: We were seated at one of these cute pink tables. 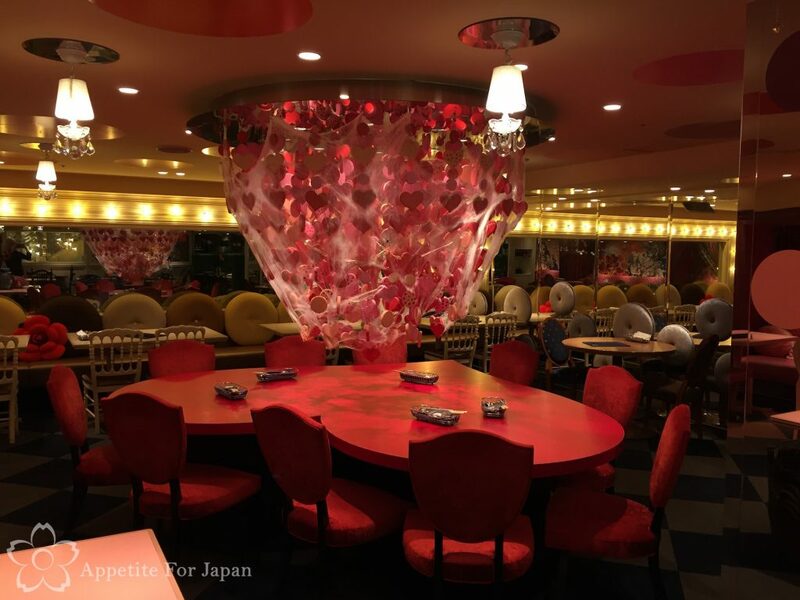 Above: Along with the furry green hedges, this big red heart-shaped table with the red heart chandelier is one of the restaurant’s signature pieces. Alas, when we visited, it was covered in fake spiderwebs. Halloween was well and truly over, but they hadn’t bothered to take down the spiderwebs. I was disappointed that we didn’t get to see the Queen of Hearts table and chandelier in all its kawaii glory, because the spiderwebs really ruined the look! We were handed two menus – the cafe menu, and the lunch menu. Only… they wouldn’t let us order anything from the cafe menu! I was disappointed by this, as it was 11am and we weren’t ready for lunch. They call this a cafe, after all, so I’m surprised that they wouldn’t let us order anything from the cafe menu at 11am, particularly given that they did hand us copies of said menu! They let me order a grapefruit juice from it, but that was it. 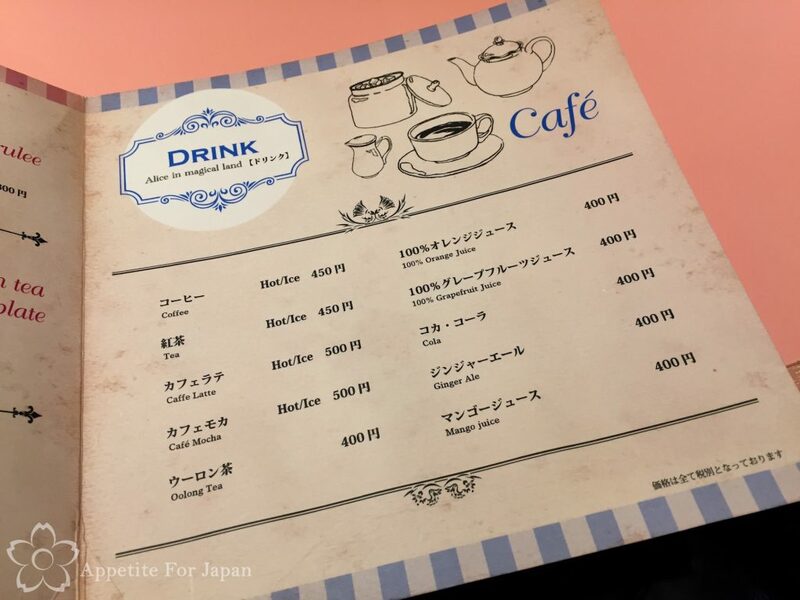 I believe that the strict ‘cafe’ time is just between 3pm and 5pm, but again, why give us the menu and then refuse to let us order from it? What is this, the mad tea party? 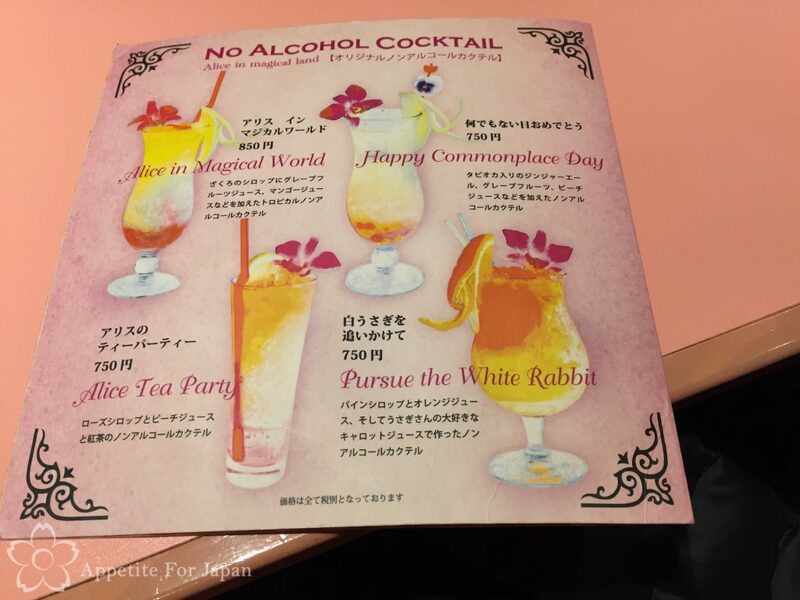 Above: Non-alcoholic cocktails cost about the same price that you’d pay for actual alcoholic cocktails at many other places in Japan, and aside from the Alice in Wonderland inspired names for the drinks, there’s nothing specifically Alice in Wonderland about them. At 11am, these options really didn’t appeal to us. However, they wouldn’t let us order desserts without ordering a main. Somehow we got away with ordering just one main and two desserts, and one drink. 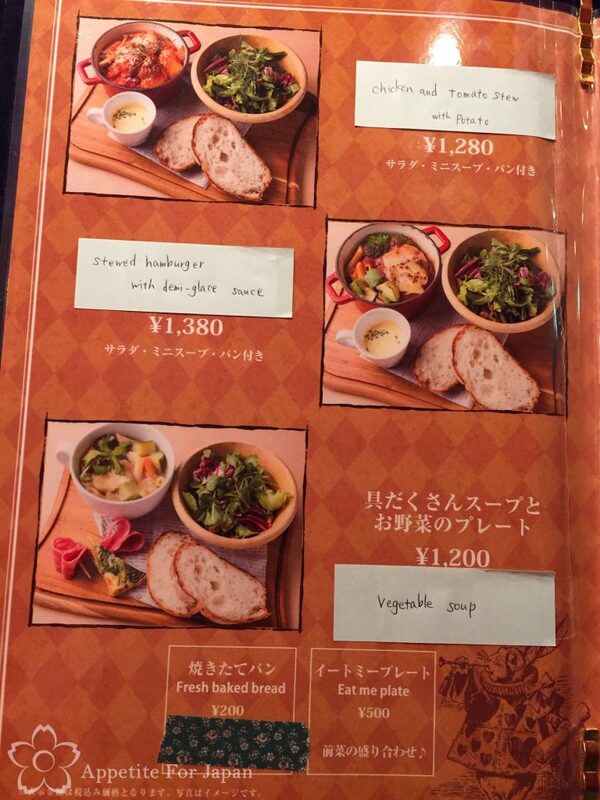 Above: Because I was forced to order a main, I ordered the vegetable soup (1,200 Yen, excluding tax). It had lots of big pieces of bacon floating in it, and some slices of salami on the side. Now, I know that vegetable does not necessarily mean vegetarian, but I really wasn’t expecting bacon in my vegetable soup. 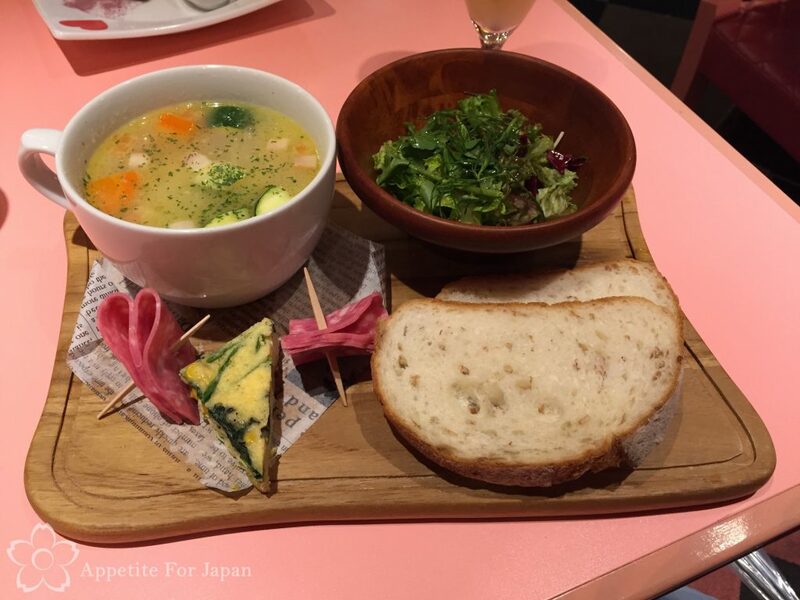 Further, the soup was sweet, the tiny piece of frittata was cold, and there was no butter for the bread. I wish I had something positive to say about this meal, but given that food in Japan is usually excellent, I have to say that this was one of the worst meals I’ve ever had in Japan. 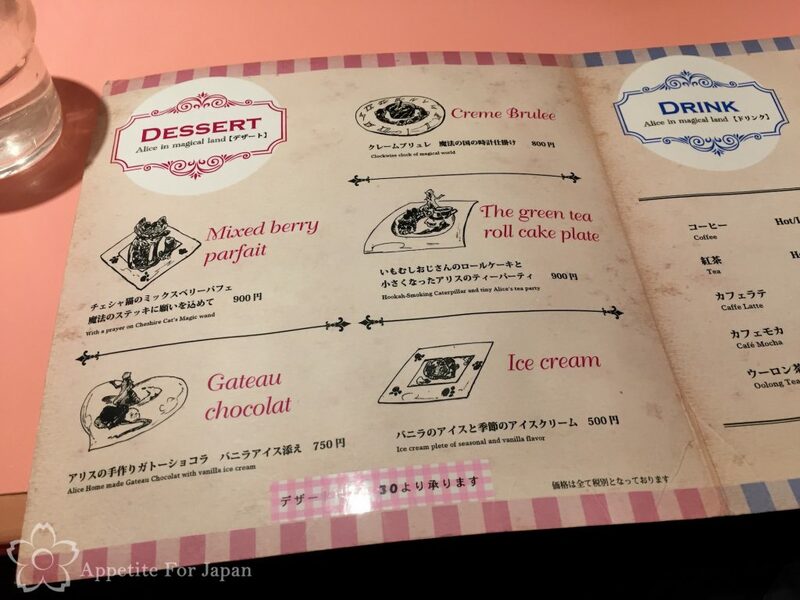 Below: I ordered the Swiss roll (650 Yen, before tax), which I think is inspired by the Cheshire cat. Nothing wrong with this, aside from being a little overpriced. 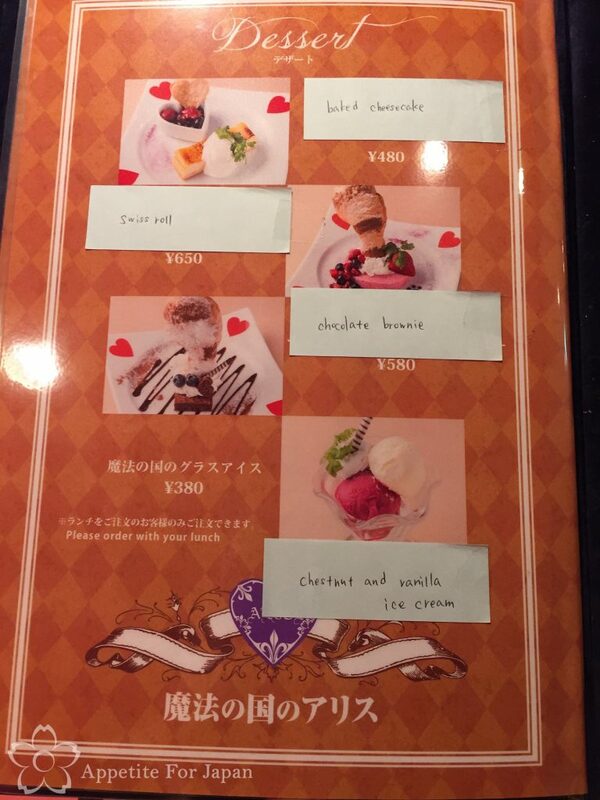 Below: My partner ordered the baked cheesecake (480 Yen, before tax) which was average. Would I recommend Alice in Magical Land? Not for lunch, no. 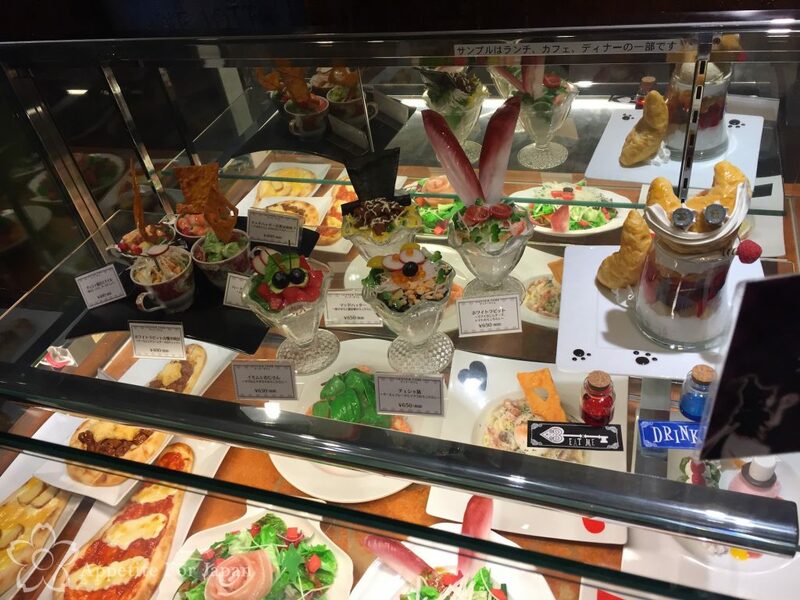 When I visited the Shibuya branch of Diamond Dining’s Alice’s Fantasy Restaurant a couple of years ago, I went at lunch time and found that the food was good but felt that some of the other branches might have had better decor. Specifically, I thought that I would enjoy Alice in A Magical Land more. Now that I’ve tried both of these branches at lunch time, I can easily say that I preferred Shibuya’s Alice in A Dancing Land. If you’re absolutely set on trying this restaurant, consider going at dinner time instead when (hopefully) the menu is better. 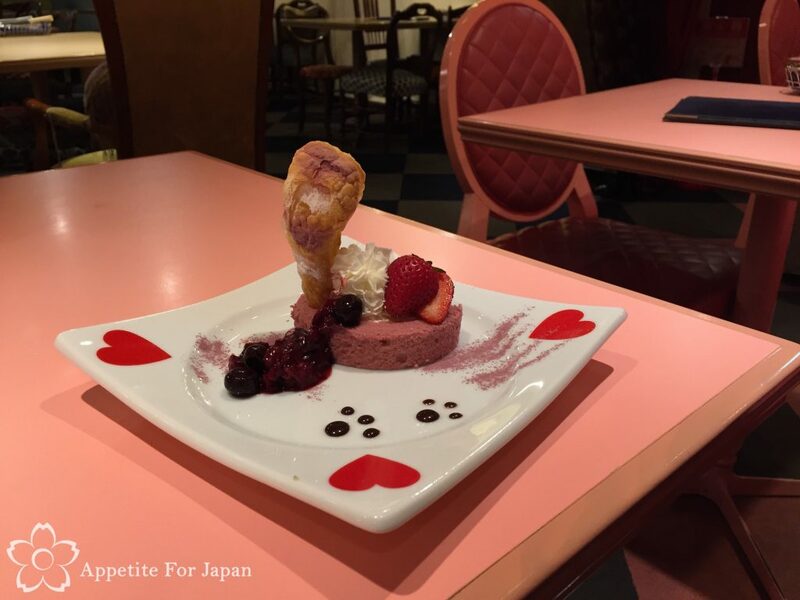 That being said, I’ve been to a lot of themed cafes and restaurants in Tokyo, and as much as I’d love to be able to highly recommend an Alice in Wonderland themed cafe, my recommendation would be to either eat at the Queen of Hearts Banquet Hall at Tokyo Disneyland instead (decent food that won’t break the bank, and awesome decor), or skip the Alice in Wonderland theme in favour of a maid cafe such as the Maidreamin Digitized Cafe in Shibuya, or one of the many good themed restaurants such as the spectacular Kawaii Monster Cafe in Harajuku (which is also run by Diamond Dining, so it’s expensive but it’s on a whole different level to these Alice in Wonderland cafes). 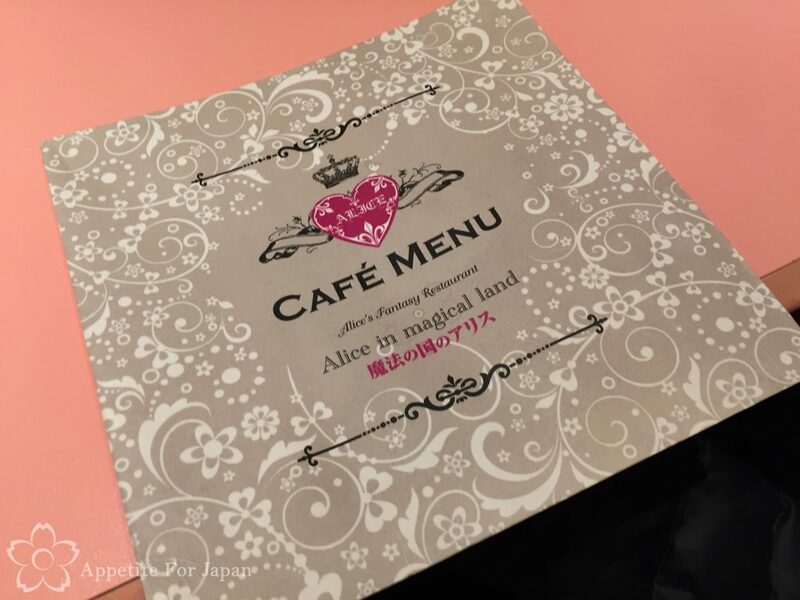 Note that there are two branches of Alice’s Fantasy Restaurant in Shinjuku. 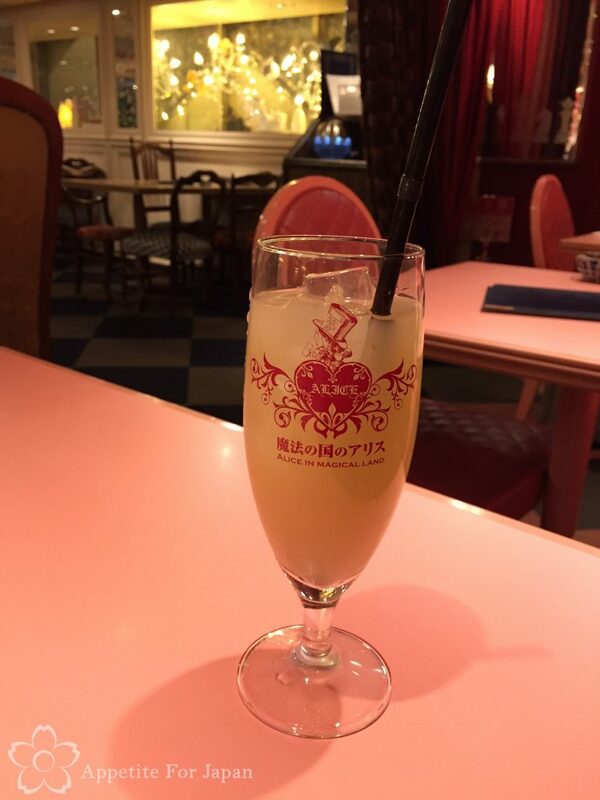 The one that I’ve reviewed here is Alice in Magical Land which is in Nishi-Shinjuku. 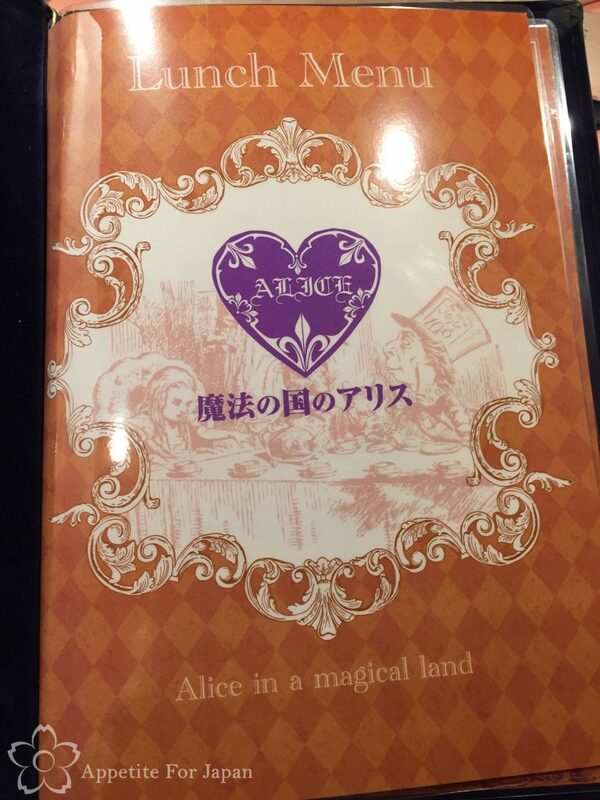 The other is Alice in Fantasy Book, which is on the other side of Shinjuku station, in Kabukicho. 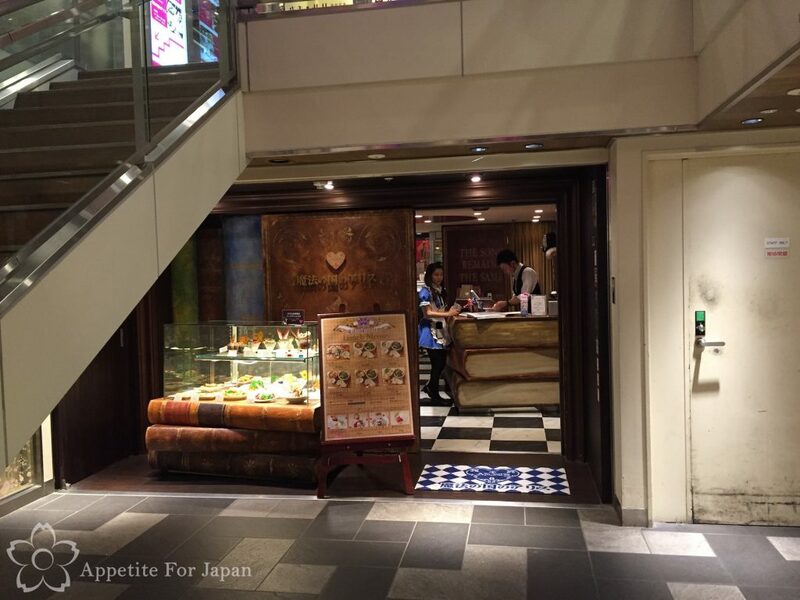 (It’s located on floor B3, the third basement level of a the Nishiguchi Hulk shopping centre in Nishi Shinjuku – you’ll need to get a lift (elevator, for my American readers) and some stairs to find your way to B3). If you’re going for lunch, you can walk straight in. I’m not sure how busy it gets at the peak of lunch time, but at 11am on a week day, we were one of only two groups of people dining there. If you’re going for dinner, you can reserve a table via the website.